A whole bunch of balances and improvements also made to characters. 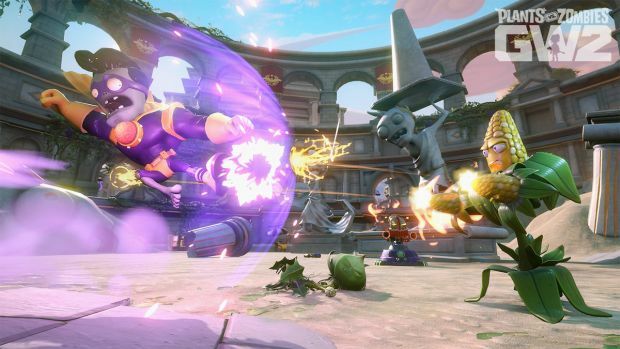 Popcap’s Plants vs Zombies: Garden Warfare 2 has received a whole bunch of new content with its newest update Trouble in Zombopolis: Part Two. First up are Community Challenges which offer optional objectives you can complete during matches. Complete said objectives and you’ll net three chests full of rewards like coins, stickers and other items. It’s also possible to check your progress with the Progress-o-meter near Town Hall but you can also find all the relevant stats on the game’s website. Then there are timed Delivery Challenges wherein players take control of a Rocket Chomper or Delivery Goat to deliver food. This turns the game into somewhat of a platformer/racer and you have to finish delivering before time runs out. Along with new challenges, the update also adds boosts to characters like improving damage and rate of fire, adding new spawn points to maps and much more. You can check out the full of changes here for more information.